1 Rinse jar (about 800 ml) (approximately 2 cups) and matching lid with boiling water and let dry upside down on a kitchen towel. Rinse cauliflower, pat dry and cut into florets. 2 Rinse mini corn cobs and drain. Peel garlic and onions. 3 Rinse chile peppers. Rinse basil, shake dry and pluck leaves. 4 Trim ends of lemongrass, remove tough outer layer and cut lemongrass into pieces that will fit into jar. Rinse ginger root, pat dry and cut into slices. 5 In a pot, bring 500 ml (approximately 2 cups) water, salt, sugar, and vinegar to a boil. 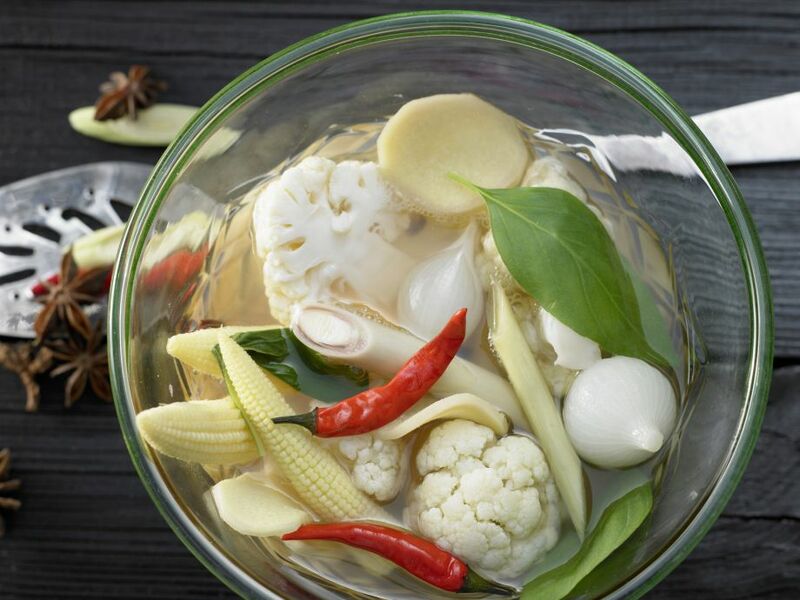 In separate batches, cook cauliflower, corn, garlic, onion and lemongrass for about 5 minutes each, removing each with a skimmer and draining in a sieve. Remove pot from heat and reserve cooking liquid. 6 Layer vegetables alternately with basil leaves and chile peppers in prepared jar. 7 Measure out 450 ml (approximately 2 scant cups) from reserved cooking liquid, adding water if necessary. Return liquid to pot, add star anise and bring to a boil over high heat. Pour hot liquid immediately over the vegetables in jar to cover. Tightly seal lid. 8 Process jar according to manufacturer's instructions (or visit http://nchfp.uga.edu/).